EPA Administrator Scott Pruitt's ever growing list of scandals is still the talk of the town. CNN dedicated another segment to it on "New Day" Wednesday morning. The most recent headline reads that Pruitt used an aide at the agency to seek a business opportunity with Chick-fil-A. Before that, reports suggested he helped two friends get a raise (which he denied), that he spent too much on travel, and that he had a suspiciously cozy condo deal in D.C. He grilled about it all on Capitol Hill in April. The New York Times's Maggie Haberman said her White House sources are eager to see Pruitt go. White House Chief of Staff John Kelly, for instance, recognizes Pruitt's skeletons are a "blight" on the White House and the party. He wants it resolved before the midterms. "It's a giant neon sign people can point to and the voters can understand if you want to paint a picture of corruption run amok, all you have to to do is talk about lotion or God knows what else," she added. But, several factors are keeping him put. Pruitt has made himself "an ear" to the president, Haberman said. What's more, he's joined Trump in trashing Attorney General Jeff Sessions. He's not doing too bad in his job either, at least according to the president's standards. He's made Trump "happy" with his accomplishments at the EPA, particularly his deregulatory agenda. Pruitt's conservative friends in Congress are especially pleased with that last item and continue to defend his post. Finally, he's a favorite among Trump's key donors. With that said, "it should not be a surprise" he's survived this long, Haberman said. 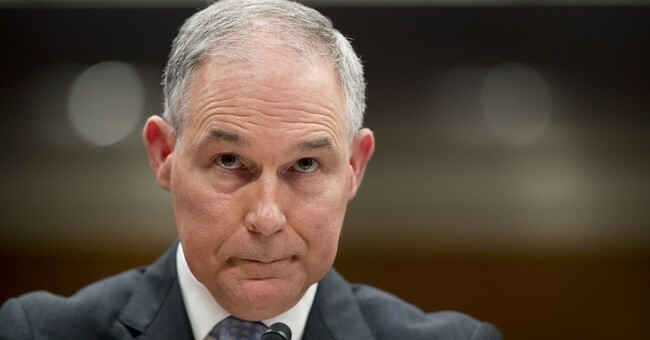 Haberman's fellow panelist John Avlon said, however, that Pruitt's scandals continue to be an embarrassment and distraction and may soon be his undoing. It's causing unnecessary "angst" in the administration.